Rebel Records has announced today’s release of “Bitterweeds,” the new single from Larry Sparks’ anticipated 50-year celebration recording, Lonesome and Then Some: A Classic 50th Celebration (REB-1846). The single is available to buy as a special pre-album promotion via iTunes, Amazon, and other online retailers. The physical and online versions of the full album will be released Tuesday, August 5th. A living legend, Larry Sparks has earned his place at the forefront of bluegrass music for over five decades. From his beginnings with the Stanley Brothers and the Clinch Mountain Boys to the present fronting his own band (the Lonesome Ramblers), Larry Sparks has toured extensively and released over 60 albums. Respected over the years as both a guitarist and a singer, Larry has been recognized with IBMA awards for Album of the Year, Recorded Event of the Year, and twice for Male Vocalist of the Year. His many signature songs include the iconic “John Deere Tractor,” “A Face in the Crowd,” and “Tennessee 1949” to name just a few. If there is an artist who fits the bill of “future hall of famer,” it is undoubtedly Larry Sparks. In 2004, Rebel Records released Sparks’ highly acclaimed 40 album, celebrating his 40th anniversary in music. 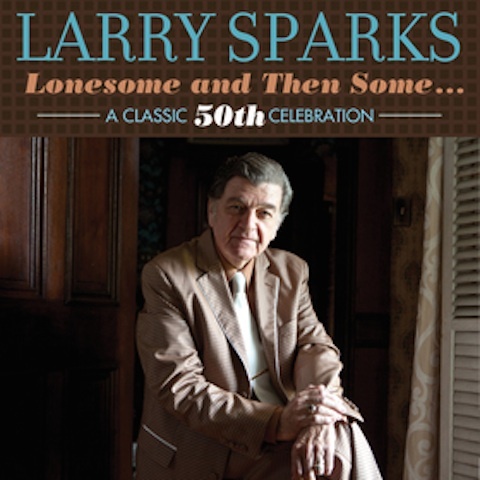 This collection, which commemorates his 50th anniversary, though less elaborate, is no less powerful as a statement of Larry Sparks’ stature in bluegrass music. On this new recording, he is joined by a number of wonderful artists who are all keystone members of the bluegrass community: Alison Krauss, Judy Marshall, Curly Seckler, Bobby Osborne, Jesse McReynolds, and of course Ralph Stanley. Closing out the album is a special previously unissued live recording featuring Larry with none other than the Father of Bluegrass himself, Bill Monroe. Now in his mid-60s, Sparks is poised to become the figurehead and elder statesman for traditional bluegrass, as many of its pioneers have now passed on. For more information, visit Larry Sparks’ website or his Facebook page.